Health Minister Aaron Motsoaledi denies that the healthcare system has collapsed. Regardless of what term you use, people are suffering due to poor care and the minister wants a pat on the back because his system works – sometimes. The roles of heroes and villains were clearly defined at the Life Esidimeni Arbitration, established to probe the death of 144 psychiatric patients in Gauteng. Health Ombudsman Professor Malegapuru Makgoba fell on the right side of history. His investigation launched the arbitration and just over six months into his job his work was crucial in the search for justice for families of patients who were sent to their lonely and brutal deaths. On Sunday, the professor commented on the country’s health system. “I think the state of healthcare, to sum it up by many other people, it’s collapsing. It’s collapsing,” he said on eNCA. Not everyone who appeared at the Life Esidimeni Arbitration fell into the categories of saint or sinner. It was difficult to judge the role of leading politicians. Premier David Makhura’s involvement is still debated. 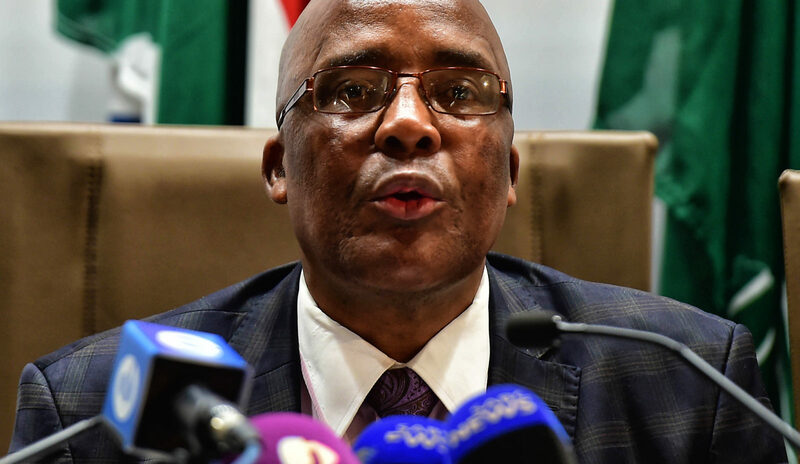 The country’s chief health official, Minister Aaron Motsoaledi, wept during his testimony and regretted that he had not been able to stop the slaughter. On Tuesday, the minister defended the health system against Makgoba’s comments. Motsoaledi responds to crises faster than many public ambulance services, but despite almost 10 years in charge the calls never seem to stop and the minister remains stuck between defending his government’s efforts and acknowledging reality. Health activists appreciate his attempts, but Motsoaledi’s curse is that even his best can only keep the healthcare system afloat. The fleet might be above water, but ships continue to sink, again and again. “It is very true and self-evident really that the healthcare system is very distressed and going through very hard times. There’s no question about that,” said Motsoaledi on Tuesday. Effectively taking a jab at Makgoba for commenting without releasing a report to back up his claims, Motsoaledi listed the health system’s successes. It provides over four million people with antiretrovirals, 300,000 with tuberculosis treatment. Over one million women give birth in public hospitals each year. Yes, 1,000 of them lodged complaints but 15,000 sent unsolicited messages appreciating the service. “So we do not really think that a collapsing or collapsed health system can be able to do these things as mentioned, but yes we accept and are very worried by the extreme overcrowding in our hospitals,” said Motsoaledi. In the last month, patients have suffered severely after health services in North West effectively shut down and had to be taken over by the army. KwaZulu-Natal’s last public oncologist has resigned, with only three specialists remaining in the province. Strikes at Charlotte Maxeke Academic Hospital saw operations postponed and patients turned away because government couldn’t pay workers’ bonuses. In Eastern Cape, ambulances haven’t been arriving as workers are on strike, reportedly leading to the death of a child. That’s not even the tip of the iceberg. The ombudsman is visiting Fort Beaufort this week after a report of psychiatric patients suffering in seclusion, without proper food or clothing. The whistle-blower who exposed the issue is being punished rather than the officials responsible being held accountable. “I think there are many Life Esidimenis that are taking place throughout our country,” said Makgoba. “Collapse” is of course subjective, but there’s no doubt people are dying unnecessarily and suffering in the public healthcare system. Motsoaledi acknowledged the challenges in North West and said changes were being made after the provincial health department was put under national administration. He challenged claims that there are medication shortages, saying Limpopo had the lowest stock of ARVs at around 85%. The minister condemned interruptions to health services caused by strikes and said it’s crucial to fill vacant posts, such as in KZN and Gauteng. The minister read out a text he’d received during the briefing. Professor Daniel Plaatjies, head of the Financial and Fiscal Commission, had told him there were four key challenges in health: financing, human resources, supply and procurement chain management, and infrastructure. Those issues aren’t new, but Motsoaledi suggested two options for improving the country’s health system. He said the details of the National Health Insurance (NHI) Bill would soon be released to provide a plan to “end this malady”. NHI could improve health services by opening up the private healthcare system to public users, but there are still questions over how it would work and be financed. On Sunday Makgoba said that despite 70 years of NHI in Britain, that system still faces financial constraints. His second suggestion was more vague, but goes to the heart of Motsoaledi’s dilemma. Despite being the public face of health, the national minister has limited powers to intervene or lead systems that are primarily a responsibility of provincial governments and their MECs, who often have little experience in the field and face far less public scrutiny than the national minister. Summing up the health ombudsman’s critique, Motsoaledi said Makgoba was trying to say that the laws should be changed to give the national government more responsibility over health. The minister has suggested that would have helped avoid the Life Esidimeni deaths and on Monday said it would mean companies like Gupta-linked Mediosa wouldn’t get paid to provide services they never deliver. NHI is in the works, with no implementation day in sight. In his Life Esidimeni report, the ombudsman recommended that national government take a stronger role in dealing with mental healthcare patients and work is under way for provinces to share the responsibility with the minister.